The Mountain Brushtail Possum, or Bobuck as it is also commonly called, is one of the largest species of arboreal marsupials living in wet sclerophyll forests in south-eastern Australia, and cool temperate rainforests patches in NSW and south eastern QLD. The southern animals of this species have olive grey fur. Here on the north coast, the Mountain Brushtail can have a variety of colors, from the common grey colour to golden, black, brown and a combination of all. Sexual maturity is reached at about 3 years of age. 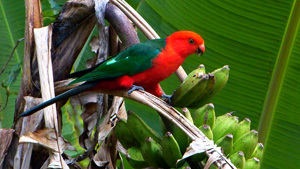 The female gives birth to normally only one young. Pouch life is approximately 120 days, after which the juvenile possum will travel part time on mums back. Mortality rate at this stage can be high. They tend to stay with their mother for much longer than other possum species. Lifespan can be as long as 17 years, possibly longer. 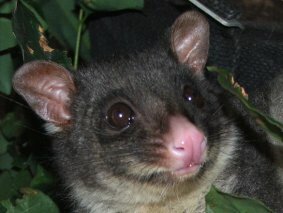 Mountain Brushtails live in hollow logs mainly found in old trees, so please think before cutting down that old tree, someone may call it home. All possums are territorial. Let us make sure that they continue to have a place amongst us. 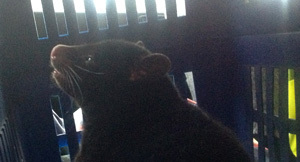 WIRES rescue hotline received a call from a local club to rescue a possum stuck in an industrial bin used for food scraps. The possum was stuck in the bin and due to depth of the bin unable to get back out. WIRES carer Ben went on the rescue and had to hop in to the bin himself in order to reach the possum. She was fairly easy to catch due to being extremely stressed and worn out from having most likely spent considerable time trying to get out, it was also discovered that she was in fact a female with a large joey in the pouch. Both were taken in to care by Leoni. Mum possum was given re hydration fluid and some native food and it did not take long before she was fast asleep with much movement within her pouch. Image below shows mum possum shortly after rescue in Bens rescue basket on route to Leoni, clearly stressed and frightened by her ordeal. 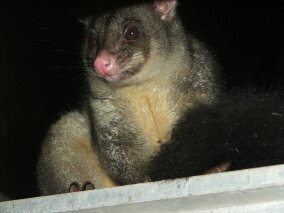 Mum possum was taken back to the club the following evening and released back in to a large fig tree, joey delighting Leoni but sticking her head out of the pouch as mum as released. We urge that all industrial bins which all have lids are actually closed. It is extremely tempting for animals such as possums to take advantage of food left in bins, once inside they are not able to escape. 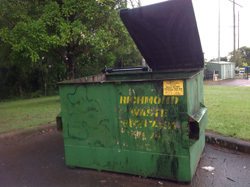 It is a frightening thought as to how many animals may in fact go to the tip or even worse go in to the compactors when the bins are emptied, the operator of the compacter not aware that a live animal such as mum possum is trapped.